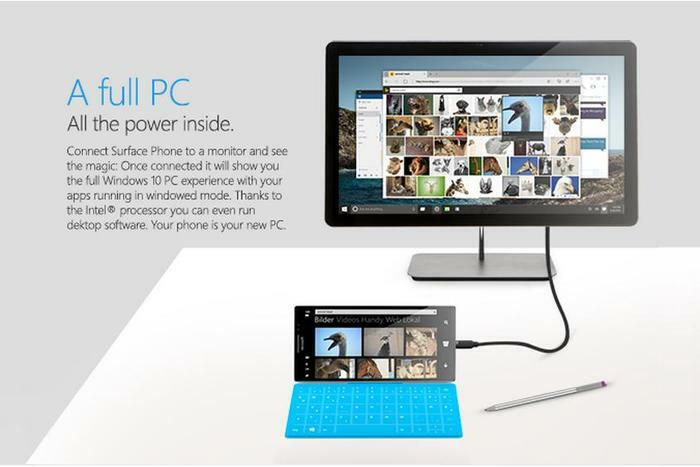 A Surface all-in-one? OK, Microsoft, wow us. Microsoft’s press event on October 26 (you can watch the live stream here) should reveal that all is not quiet on the Microsoft front. For months we've watched rumors fly about new or updated hardware, Windows upgrades, and more—some likely, others not. Here’s what we’re hearing, and how likely each rumor could come true. What we’ve heard: Microsoft set out to define new product categories with its Surface line, and the Surface tablets clearly succeeded—at least on the third iteration. Now Microsoft appears to be preparing to break trail again with a Surface all-in-one desktop, which may be called the Surface Studio. Microsoft filed this image with the FCC. Is this the hint of a new Surface AIO? 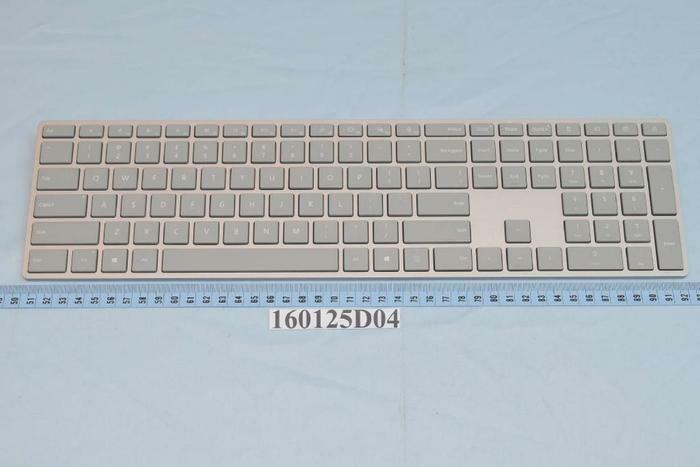 What seems likely: Right now, the most solid hint of Microsoft’s Surface AIO is an FCC filing for both a keyboard and mouse, shown in Surface gray. The thinking goes that the two devices have to connect to something, most likely a desktop. Dedicated trademark blog site The Trademark Ninja also reported that a possibly Microsoft-affiliated company has trademarked the term “Surface Studio,” which could be the AIO's name. Late on Monday, Windows Central postulated that a related "Surface Dial" could in fact be a Surface peripheral similar to a Wacom remote, designed to store an artist's most frequently used shortcuts. 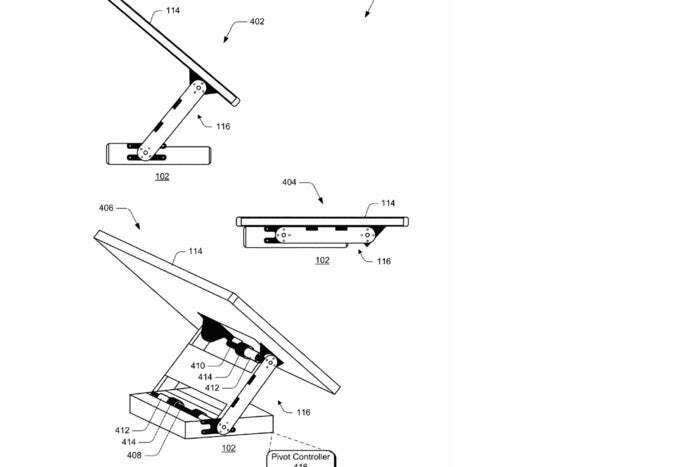 From there, it’s speculation: A Microsoft patent implies that the AIO could have a modular base with stackable components, much like the Acer Revo Build. Maybe a 27-inch 4K display? We can probably assume, however, that the AIO will contain a front-facing camera with Windows Hello capability. Another look at Microsoft’s AIO patent shows a swiveling hinge that could pivot the display from a desktop to a more traditional monitor view. By the way, sources say Microsoft isn’t planning to announce an Intel Kaby Lake version of the Book or the Surface Pro 4 at this event, though an update to both products is expected eventually. 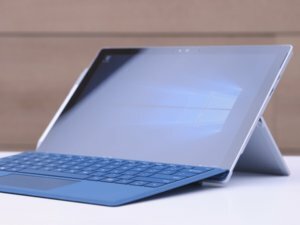 (Entries on shopping sites that refer to the existing SP4 as a “2015 version” —fodder that a new version is due—are being sold by third parties, with no evidence of inside information.) Rumor has it that eventually the Surface Pro line will be incremented ahead, and known as the Surface Pro 5. If Microsoft simply refreshes the Book with a new processor, however, it may simply be called the “new” Surface Book. What we’ve heard: Microsoft’s event invites reporters to “see what’s next for Windows 10.” The company will likely be talking about Redstone 2, the next major Windows 10 update (and one of two due in 2017). What seems likely: I don’t think it’s realistic to expect a lengthy, Build-style rundown of everything Microsoft has in store. But I’d expect chief executive Satya Nadella to outline the future of the Windows ecosystem—and in particular, what its mobile strategy is. By all indications, the company is moving on from consumer phones and returning to its traditional strength—writing operating systems for third-party hardware manufacturers. It’s reasonable to expect executives to outline a few key, noteworthy features they’re developing, along with public airings of features that Microsoft has shown off relatively quietly at developer conferences, such as this roadmap of Microsoft’s Continuum solution for Windows 10 Mobile: windowed apps, taskbar submenus, and the like. 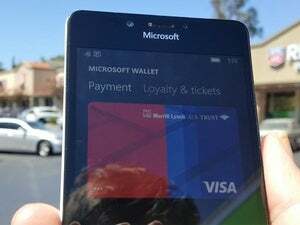 What we want: The problem, of course, is that, right now, there is no public future for Windows 10 Mobile. Acer’s Liquid Jade Primo and HP’s Elite x3 represent the latest and (almost literally) only Windows phones being sold on the market today. The future of Windows 10 Mobile most likely involves virtualized Win32 apps. 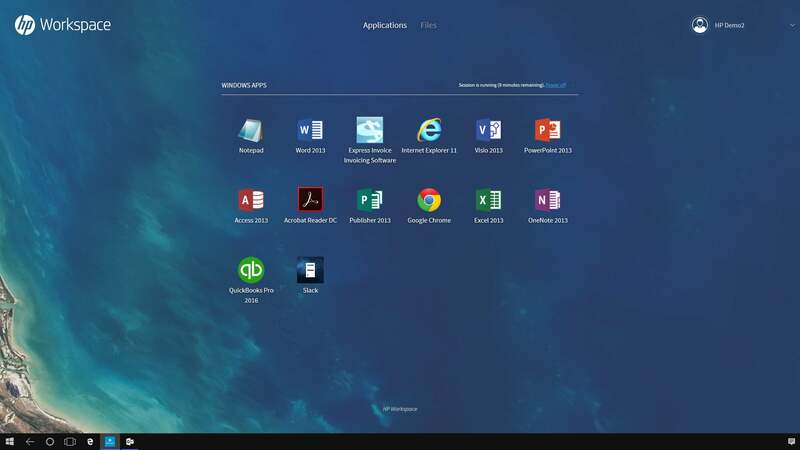 I still think, however, that Microsoft’s strongest argument for Windows 10 Mobile is HP’s Workspace: virtualized Win32 legacy apps, and a solution no other OS comes close to offering. I’d like to see Microsoft executives praise Workspace, then state that Microsoft can and will implement a similar virtualization solution, powered by Azure, for a price that even mainstream consumers can afford. The next question, of course, is what to run it on. 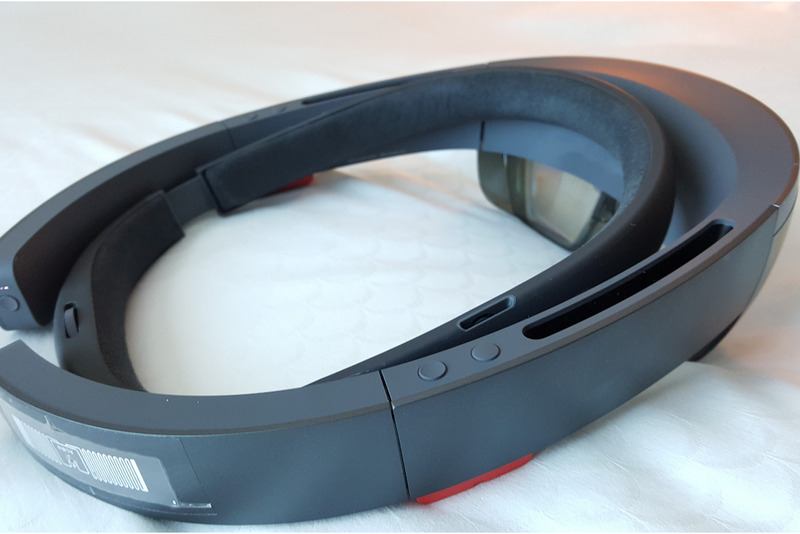 What we’ve heard: ZDNet’s Mary Jo Foley thinks the time is ripe for Microsoft to start making its case for HoloLens, especially because Redstone 2 adds the Windows Holographic shell. Microsoft’s HoloLens. When will its time come? What seems likely: What recent Microsoft press conference hasn’t included a HoloLens demo of some sort? Microsoft may indeed talk it up, but there’s going to have to be some real meat on this bone. Mary Jo thinks the selling point of HoloLens will be 3D storytelling tools, like a new 3D version of Paint that leaked recently. I’m a bit more skeptical. What we want: Microsoft’s taken a go-slow approach to HoloLens, which is perfecty fine. But I agree with Mary Jo: If HoloLens is a key component of the Windows ecosystem, it’s time to reveal just how big a role it will play. What we’ve heard: Nothing. 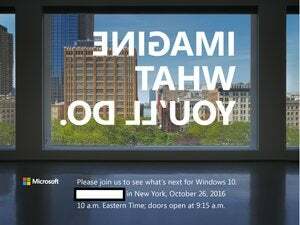 Reporters, fans, analysts and partners are waiting for Microsoft to answer the question: Is there a Surface phone? Is this what the Dial is? What seems likely: Microsoft certainly won’t launch the phone at the event, and even a glimpse of it would certainly be newsworthy. What Microsoft needs to do, though, is put minds at ease: Is there still an opportunity for a “category-defining” Surface phone? I would say no: my bet is that Microsoft’s Surface phone died when Intel essentially killed off the Atom. But the Trademark Ninja also dug up a “Surface Dial” trademark, which sounds very much like a phone. What seems certain, though, is that Windows 10 Mobile will live on. Microsoft will wholeheartedly back hardware partners with UWP apps, as well as legacy, virtualized Win32 apps. 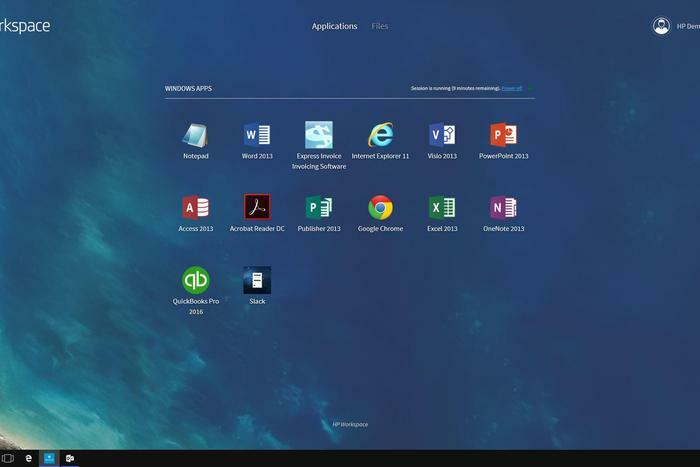 I believe that Microsoft sees this combination as wholly unique, and that we’ll eventually see Microsoft’s own version of the HP Workspace Win32 virtualized app subscription, but powered by Microsoft’s own Azure cloud. Could a Surface Phone replace an actual PC? Given the Atom chip in the Surface 3 tablet, it didn’t seem too unrealistic...until Intel killed the Atom. What we want: Here, my heart contradicts my brain: I’m still hoping that a killer productivity phone is waiting in the wings. I’m heartened, though, by reports that say HP's Elite x3 uses the same fingerprint sensor found on some of the latest flagship Android phones. If Microsoft can’t capture some of that old Lumia magic, maybe one of its partners could at least build a phone that uses the best components in the Android world. What we’re hearing: Smart appliances: Amazon has one. Google does too. We’ve privately wondered why Microsoft hasn’t bothered shipping a Cortana-powered gizmo that could do the same. Noted leaker Walking Cat seems to think that Microsoft will, eventually. So far, this LinkedIn link is about the only indication that Microsoft might be planning a Cortana-based device to compete with the Amazon Echo. What seems likely: I tend to believe that Microsoft explored cooking up its own Cortana appliance, though I’m skeptical that it’s developed enough to show off this week. Microsoft has no viable home-control solutions outside the Xbox. Sure, this NYC event could be Microsoft’s in-home coming out party, forging connections between an AIO, Xbox, your Office PC, and more. But that seems rather wildly speculative, if not overly ambitious. What we want: If this is real, Microsoft is going to have to sell me on why I’ll want it. Microsoft has a solid foothold in the living room with the Xbox, and Cortana’s a decent assistant. But a home hub doesn’t really strike me as a viable product, given Microsoft’s focus on productivity. 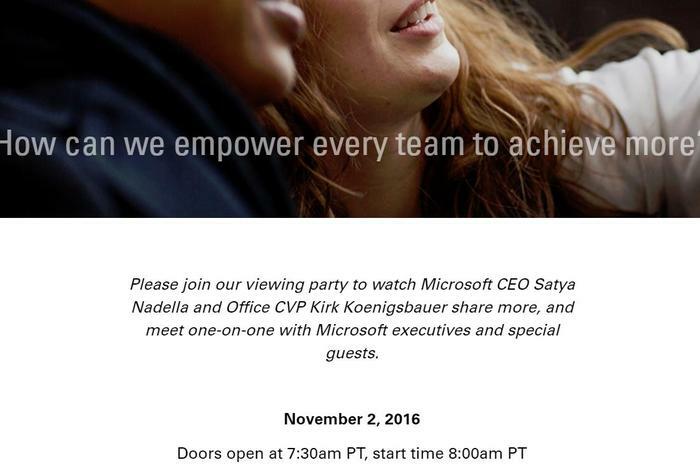 What we’re hearing: PCWorld has also received an invitation to a second event on November 2, where chief executive Satya Nadella and Office chief Kirk Koenigsbauer will “discuss the changing nature of connectivity.” It’s possible that some of the themes and products announced this week will be used as touchpoints for next week’s discussion. What seems likely: Office, Skype, collaborative features, possibly a dedicated Office assistant. 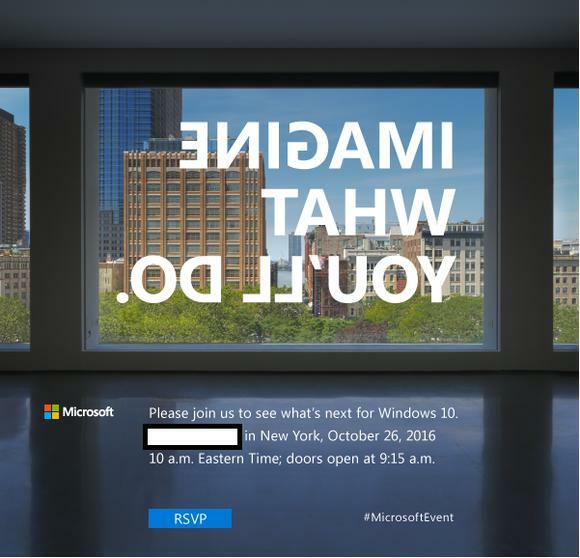 A screenshot of a Microsoft Sway invitation to an event on Nov. 2. What we want: Microsoft’s original Surface tablet launched Windows RT into the world. Ill-fated as that venture was, it demonstrated that Microsoft’s hardware and software work best when they complement each other. We all know that Windows 10 Mobile struggled and failed due to the lack of third-party apps, and Microsoft’s own weren’t enough to overcome that. Windows and Office were the original bookends of Microsoft’s business, and the two press conferences should also be seen as complementary. If Microsoft believes that the Surface AIO, Windows 10, and whatever else it announces depend upon productivity, then this second presentation should show how it all will work together.